Thanks to an inside source at Las Vegas Metro Police Department, we have confirmation that a concealed carrier exchanged fire with the two shooters yesterday. For those unaware of the story, two LVMPD officers were shot and killed by a couple while eating lunch at CiCi's Pizza. One of the officers was attacked from behind while refilling his drink and died instantly. The second officer was then engaged by the woman and suffered multiple gunshot wounds while returning fire. The killers stripped the officers of their weapons and ammo and calmly left the restaurant toting large black bags. While walking past a witness stated said they just killed two cops and crossed the parking lot toward Walmart to continue their rampage. "We saw when the man was walking, he was shouting, yelling bad words, and suddenly he had a gun," she told the station. "It was terrible, it was terrible. That man was crazy," said Pauline Pacheco who fled the Wal-Mart with her father after seeing the gunman. As the man and woman approached Wal-Mart they were confronted by an armed citizen - Joseph Robert Wilcox. Wilcox drew his handgun and exchanged gunfire with the man. The woman managed to sneak behind Wilcox and shoot him at close range. It is unclear if Wilcox was able to wound the man during the exchange of gunfire. What is clear is that Wilcox slowed the couple's entry to the store giving police additional moments to arrive, saving an untold number of lives inside. 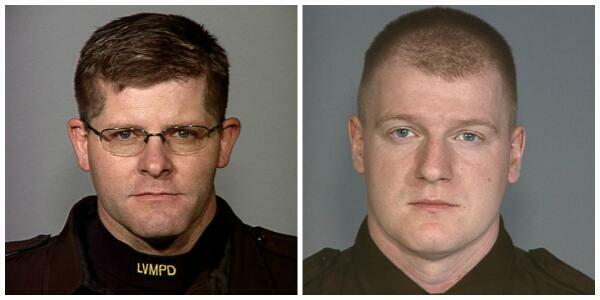 According to Las Vegas Sheriff Doug Gillespie said Wilcox "died attempting to protect others." When police did arrive, the couple briefly shot at them before fleeing into the store. Authorities dispatches two SWAT teams to enter the store from the front and rear exits of the store. Officers then parked a patrol vehicle against a rear fire exit, preventing the couple from escaping when the man tried to blast his way through with the shotgun. The killers exchanged gunfire with the cops at several points as the officers moved in, and both were eventually wounded by officers. One officer got to the store’s security area and used the video surveillance system to help the others corner the killers, who used items from the store to form a defensive barricade. They continued trading shots with cops until Amanda the woman then shot the man before turning her gun on herself, ending their "revolution". The officers bodies were escorted by motorcade and met by an honor guard en route to the coroner's office. Our thoughts and prayers go out to the families and friends of Officer Alyn Beck and Officer Igor Soldo and to the entire Las Vegas Metro Police Department. Our prayers also go out to the family of the Joseph Wilcox and his family and friends. This story needs to be seen by everyone one. share it up! After I'd heard about this and got home from work Monday morning, I searched all over news sites for more details. I went through about 20 sites, and only TWO mentioned Mr. Wilcox. I'm so glad that Sheriff Gillespie mentioned him. I commented on it on the local news site at The Denver Post. The hoplophobes were yelling back at me about, "SEE? The good guy with a gun was a dumbass and didn't make a bit of difference!" I wonder if these jackwagons would have the guts to say that to the two police officers that were murdered. They, also, had guns. good point. i hadn't even thought about that.